Dame Tartine is a name I have heard of for some time now as it tends to be a favourite spot for a couple of people I have met and who have contacted me. It’s not in the area I usually review, in fact, it falls between where most of my reviews tend to be so it gets missed whenever I want to review something. 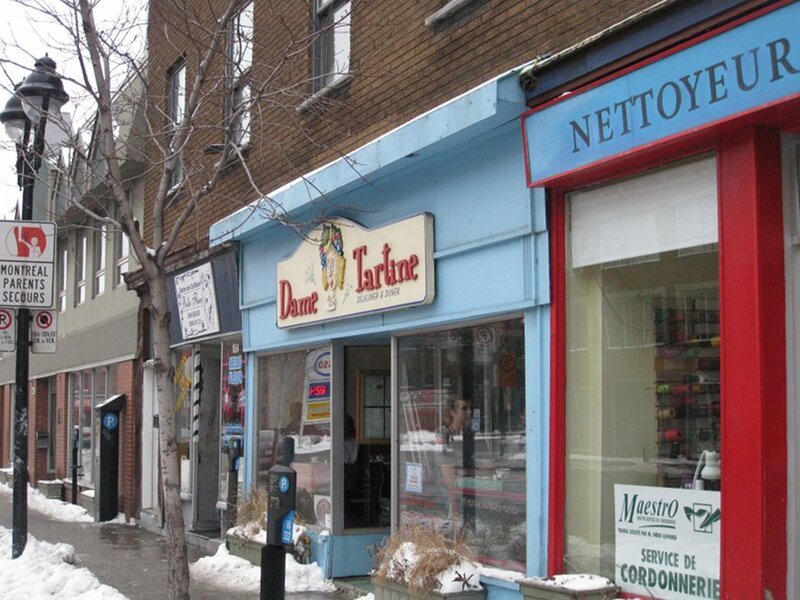 But, finally one day, we felt like being adventurous so Dame Tartine came on the radar and off we went. Cheap parking meters greet you when you get there. Having paid $6 for 2 hours downtown, anything that brings us back to normal parking prices is welcomed. The place itself stands out with a giant sign and blue siding with a window showcasing people eating. The inside looks unchanged from the 1980’s even though I don’t think it’s that old. The inside has lots of tables and some banquettes with a cash register at the end and washrooms at the right. The interior is simple but the place will fill up with people who know about it and it’s not only locals; people will come from outside the neighbourhood just to savour the food. 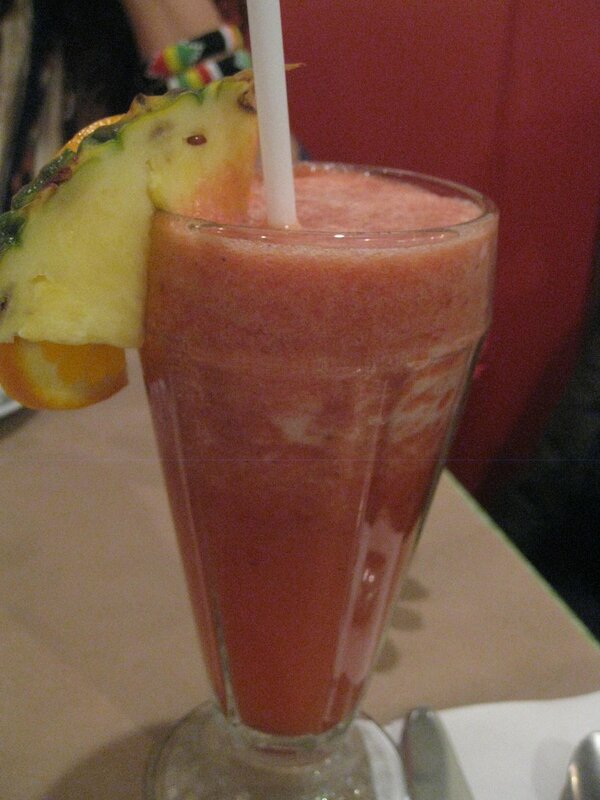 We started off with a fruit drink ($4.25) which actually tasted like a smoothie. The fruit is varied and changes depending on what they have in stock. The taste was quite impressive and the price was also quite fair. There was some good thickness in the drink and you tasted lots of berries in it. I was quite impressed by this drink and if you find yourself here, do consider it. Next came the crepe ham, spinach and goat cheese ($9.25) but my friend dropped the ham since she is vegetarian. The dish came with coffee and free refills as well. The dish was served as two folded crepes with herbs lightly coating the top. i find that the spinach and goat cheese combo is always a great idea. The goat cheese was also nice and strong while still pairing nicely with the spinach and not overpowering it. There was also a side of maple syrup and apple sauce. 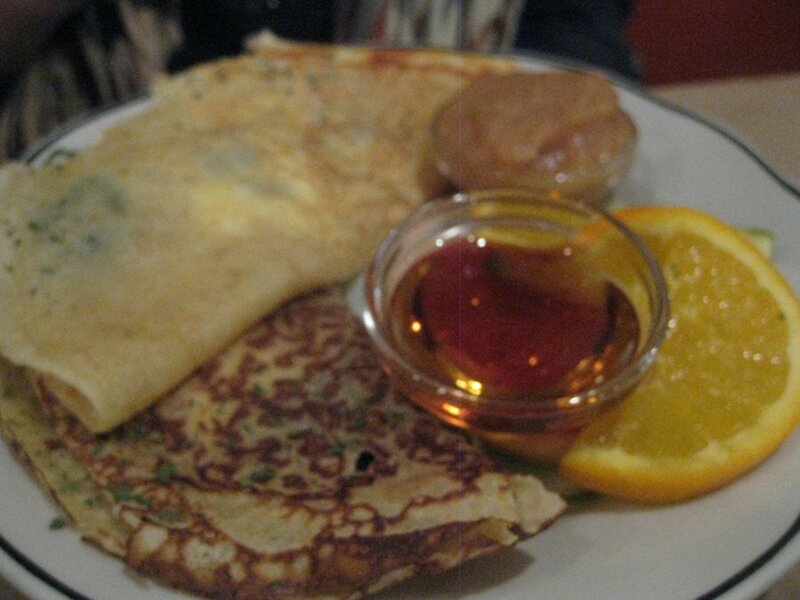 The apple sauce was a very nice touch and you often do not find that in a brunch dish. Sadly ,there was only one fruit slice and I would have liked more. The dish overall was very tasty and light. I ordered the pecheur ($12.45) which had smoked salmon, poached eggs, a side of potatoes and an option of mornay sauce or hollandaise as well as coffee. The price is average considering there is coffee included. There was more fruit in this dish than in my friends although I always want more. The smoked salmon was very good and the hollandaise sauce that I ended up choosing was light with some well poached eggs. I did feel the dish was a little too light for my preference but I was starving that day and not all appetites are the same so you can be the judge when you go. Since both of us still had some space in our bellies, we decided to try something sweet like the fruit de camp crepe ($9.95). This dish hit the jackpot and really impressed me. Up to this point the food was good but this dish kicked it up a notch. Our plate came to us with crepes topped with loads of berries and a coulis sauce so dark one would think it was chocolate. 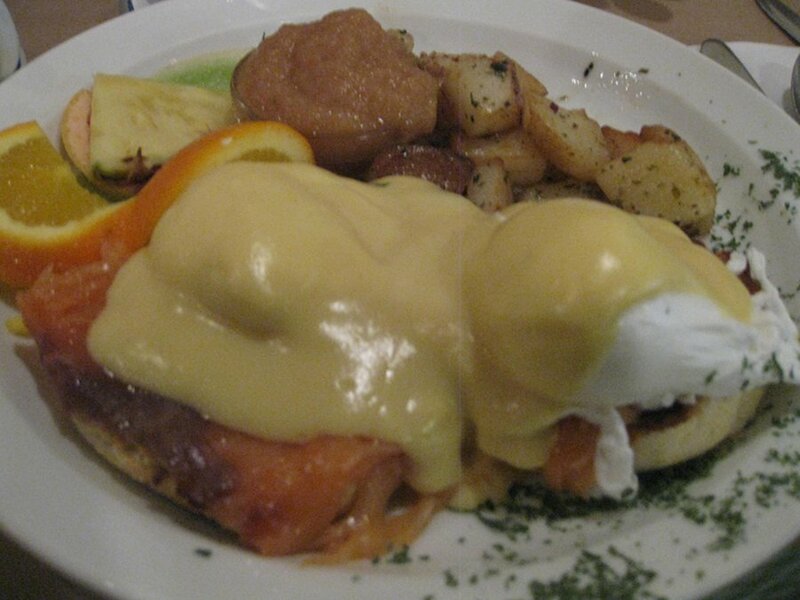 There were fruits on the side which were similar to the eggs Benedict dish and there was maple syrup and apple sauce. The taste in this dish was amazing and it was filling as well. The fruits were loaded with taste and every bite made you want more. We also have a potato review from our resident potato expert Batata who ended up going recently so we can dig a little deeper into their potato offering, his take on it was: I am feeling much better about the breakfast potato experiences that I have been faced with as of late. The portions, as a side dish, were appreciated. Although the frozen potato cubes are being purchased from the same food distributors as the vast majority of breakfast places, at least the cooks are defrosting them beforehand and adding their personal spice melanges. In this case, it was probably a steak spice mix that I found too salty for my personal liking. I don’t normally add much salt to my cooking so the level of salt can actually be acceptable to others. I had to mask the salt The oil used for the frying was acceptable. I think I will rate this one 2.5 out of 5. Keep in mind that I have not given any form of breakfast potato higher than 3.5. Our waitress was really nice and chatty as she helped make some good menu suggestions. Coffee refills were ok, although, at some point I think she forgot about us. More than half of the menu is vegetarian friendly and you can ask them to drop a meat item like my friend did. I would have liked them to sub it with something else instead of just dropping it, but hey, that’s life. There are no real vegan options. I was quite happy to have finally gotten a chance to see Dame Tartine. 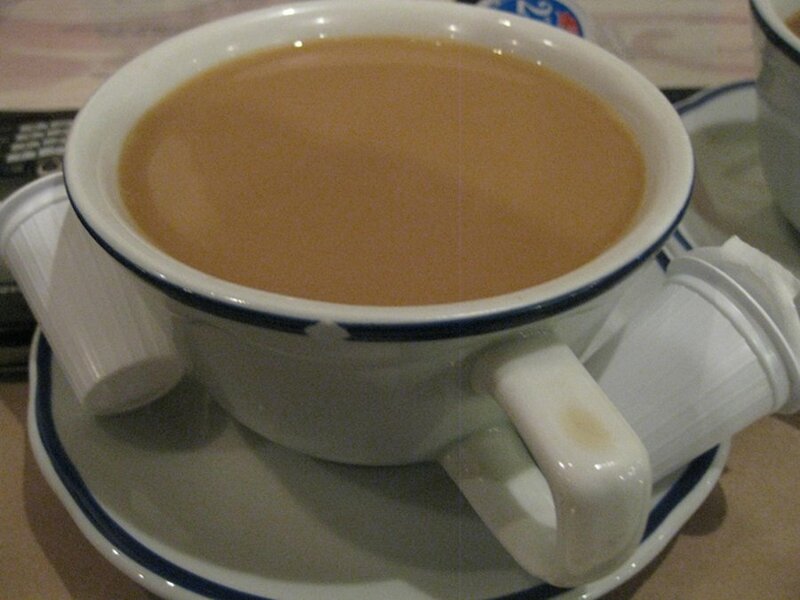 The dishes were averagely priced and I like that coffee was included. They do a tasty approach on a classic breakfast but I would have loved to see waffles on the menu. The sweet berry dish we had was amazing; the cheese and spinach crepe was good but I felt that my dish was a touch on the light side. Overall, if you are a hearty eater this may be light for your taste but if you like tasty classic breakfast food then this is your spot. They get extra brownie points for being open 7 days a week as well as early in the morning. I use and like your reviews, really good info but come on, what’s all the nonsense about cheap parking? At 7 minutes from a Metro station, it’s scandalous to arrive there any way other than transport en commun! Thanks for the compliment on the reviews, and although metro & bus are great ways to get around the city they can be rather slow if you do not live downtown or near a metro. When I went to Dame Tartine I was not near a metro and others who like to do brunch come from all parts of the island. Case and point RDP which would take 1 hour and 40 minutes by public transit (1 way only) vs 27 minutes by car. That almost 2 hour commute alone takes more time than the brunch itself. As well West Island and south shore people have it even worse with weekend buses passing by once an hour in some areas. I hope one day all parts of the city will benefit with speedy, cheap and readily accessible public transit, but until then people will have to drive to get around in a timely fashion.